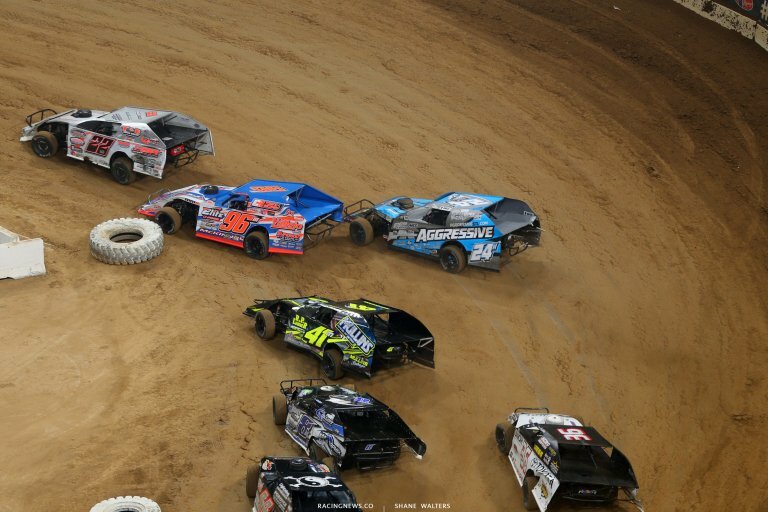 Tonight, the Gateway Dirt Nationals comes to a close. 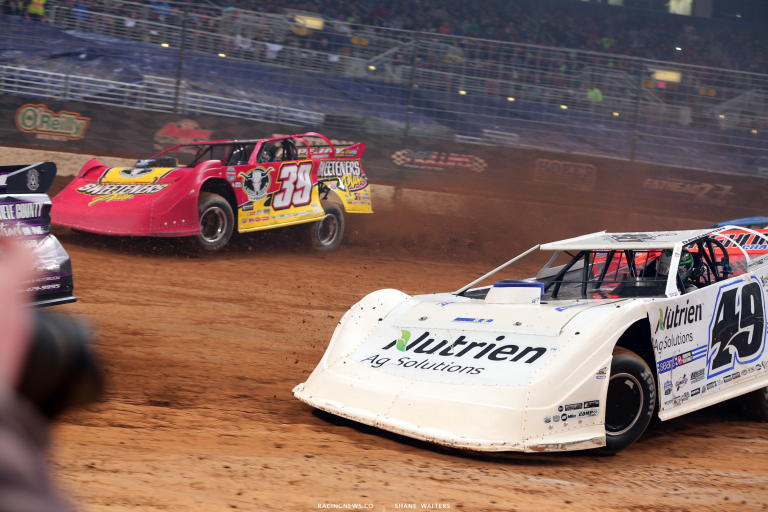 The dirt late models will race for 40 laps and $30,000. The dirt midgets will race for 30 laps and $10,000. 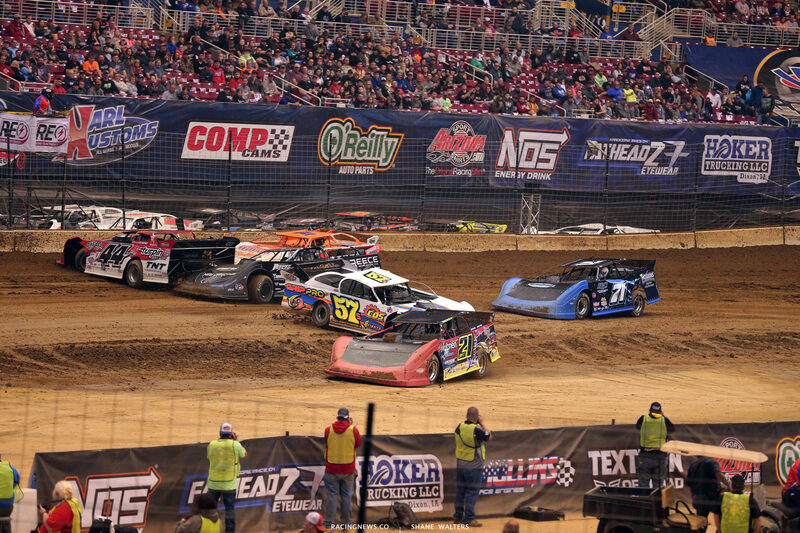 Additionally, the dirt modifieds will race for 30 laps and $10,000. 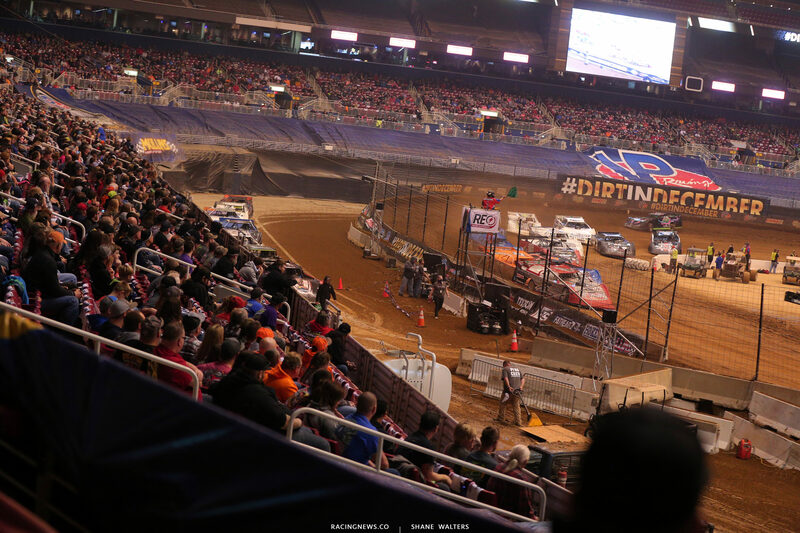 View 2018 Gateway Dirt Nationals results below. Jonathan Davenport and Ryan Unzicker set the front row for the first LCQ of the night. Bloomquist starts 10th and the top two advance. Trouble for Rusty Griffaw in the warm up laps. Running over the cushion folded his nose under the front end. He heads to the pit area before the green. Unzicker is on the infield with the hood up, he re-fires. Green, Davenport wins the race to the bottom. Unzicker slots in 2nd. 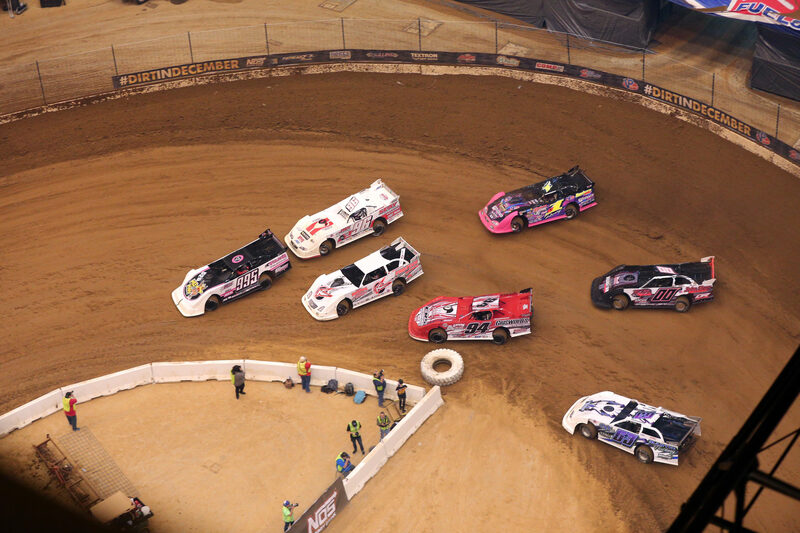 Bloomquist is picking off a car per lap. Lap 2, they’re four wide for 5th on back off turn four. They finally ran out of room. Mark Shipman slides to the infield. 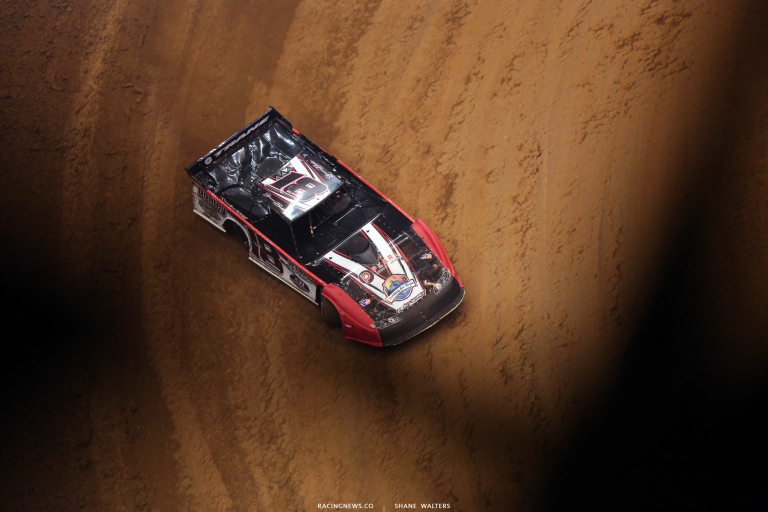 As the field checks up, Bloomquist gets into the back of Luke Goedert and turns him into the outside wall. Green, Davenport is gone. He stretches out to a multi-car lead. Davenport cruises to the win the the first LCQ of the night! Unzicker takes the final transfer position. Camaron Marlar and Greg Kimmons will lead them to the green in LCQ number two. Green, Marlar cuts to the bottom. Kimmons is hung on the outside and Eric Hickerson moves to 2nd out if turn two. Carpenter is flying through the field. He’s up to 3rd. The caution is out for a spin in turn three. Green, Carpenter cuts to the bottom across the nose of Hickerson. He’s up to 2nd. Spin in turn two. Green, Marlar and Carpenter break away from the field. Marlar takes the win in LCQ number two! 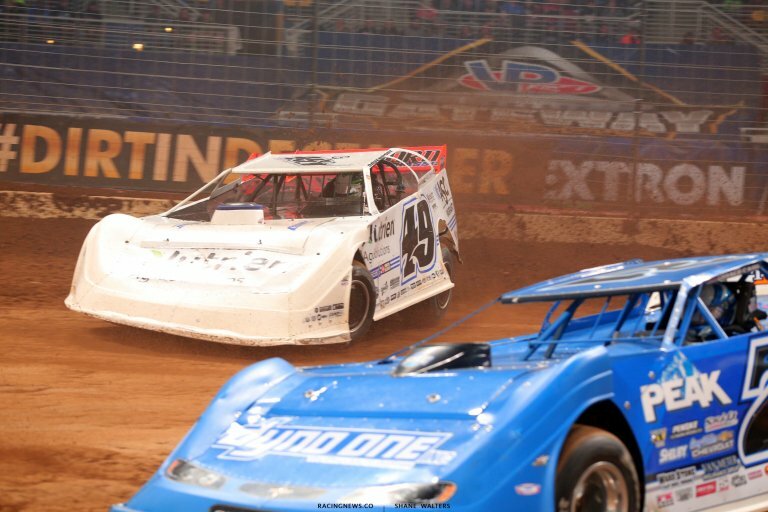 Joey Coulter and Gordy Gundaker head for the starting line in LCQ number three. Green, Coulter leads. Rich Bell moves to 2nd as Gundaker is hung on the outside. Lap 2, the caution is out. Green, Coulter still leads. Bell holds 2nd. The field drops to the bottom. Final lap, Chris Fetter is upside down the back stretch as Coulter takes the checkered flag. This race isn’t over yet. Green, Bell runs wide in turn 1! Gundaker crosses under him off turn two. They run even down the back stretch. Gundaker takes 2nd as they head into turn three. Bell is looking under him. The run door to door at the line! Coulter wins! Gundaker takes the final transfer spot by just a few inches! Shannon Babb and Mike Fryer lead them to the fag stand in LCQ number four of the late model division. Green, Babb leads. 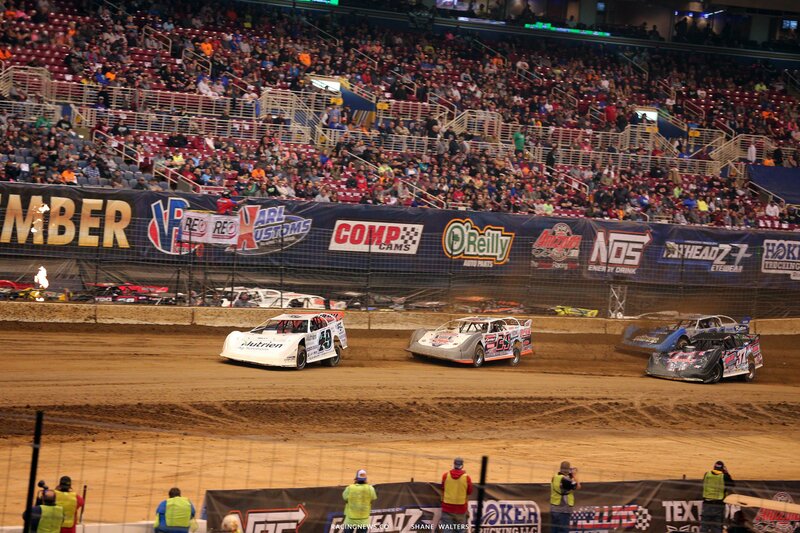 They run three wide for 2nd. Feger takes that position. Spin back in turn one. The caution is out. Green, Babb leads. Spin, caution. Green, Patrik Daniel has found speed around the top in turn one. He’s door to door with Feger for 2nd. Caution. Green, Daniel makes it work on the top as Feger bobbles on the bottom. Babb drives away. Daniel is smoking out the back but he’s still rolling. Shannon Babb takes the win in LCQ number four! Manny Falcon and Tanner English set the front row in LCQ number five. Green, Falcon leads. Carpenter and English run side by side for 2nd. English noses ahead and cuts to the bottom across the nose of Carpenter. English has caught the bumper of Falcon. He’s looking for a way by. Falcon runs wide and English fills the inside lane. They bang fenders for the lead as English forces him further up the track off turn four. Bob Gardner and Logan Roberson lead them to the flag. Green, Caleb Ashby is around in front of the field in turn one. Several cars are collected. The caution is out. Green, Gardner leads. Spatola to 2nd on the outside. Two cars spin for another yellow flag. Green, Spatola is on the bumper of the leader. Garder pushes through turn one and Spatola closes two car lengths. Gardner holds on to take the win in the final late model LCQ of the weekend. Spatola takes 2nd. 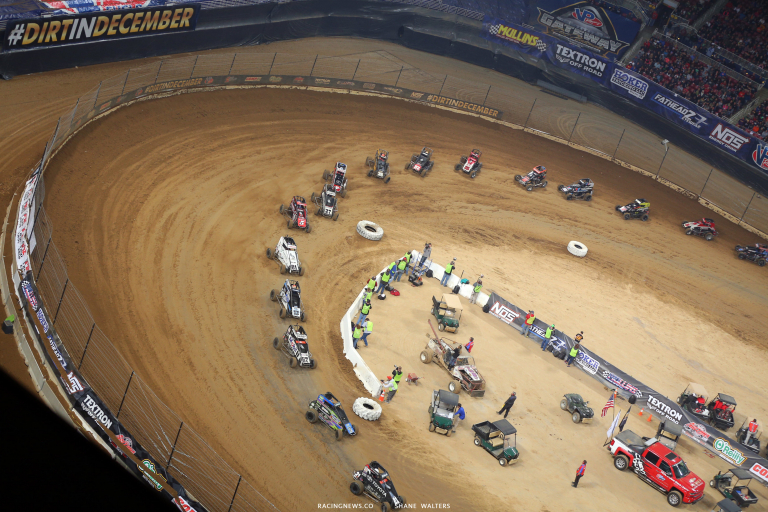 Next up, it’s a 40-lap main event. 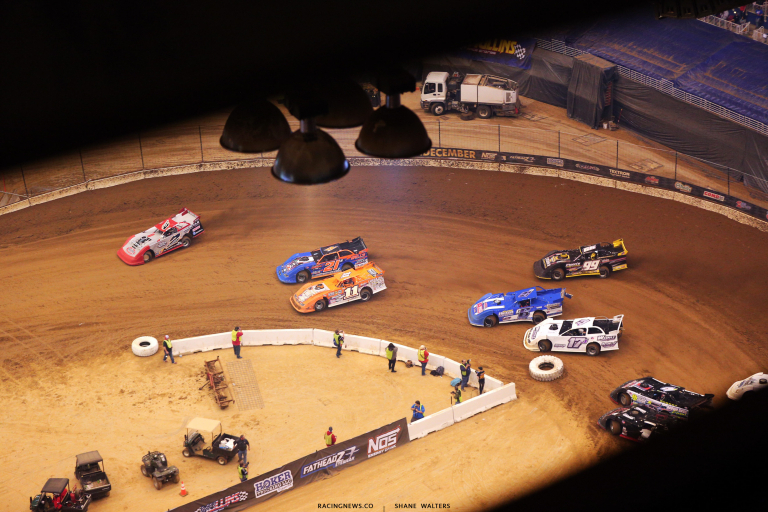 Dirt late models are set for some indoor dirt racing in downtown St. Louis, MO. 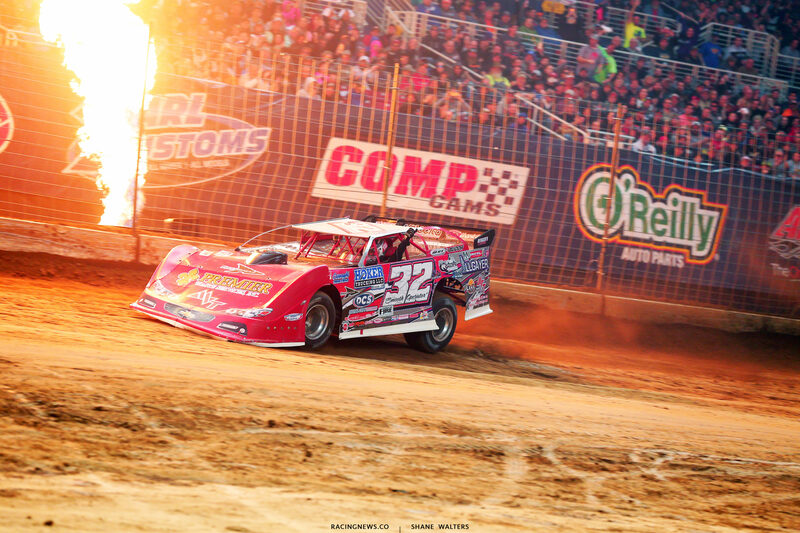 It’s the 2018 Gateway Dirt Nationals headliner race and drivers have rolled to the race track. The feature winner will pocket a check for $30,000! Bobby Pierce and Don O’Neal will lead them to the starting line. Green flag, they slide into turn one side by side. 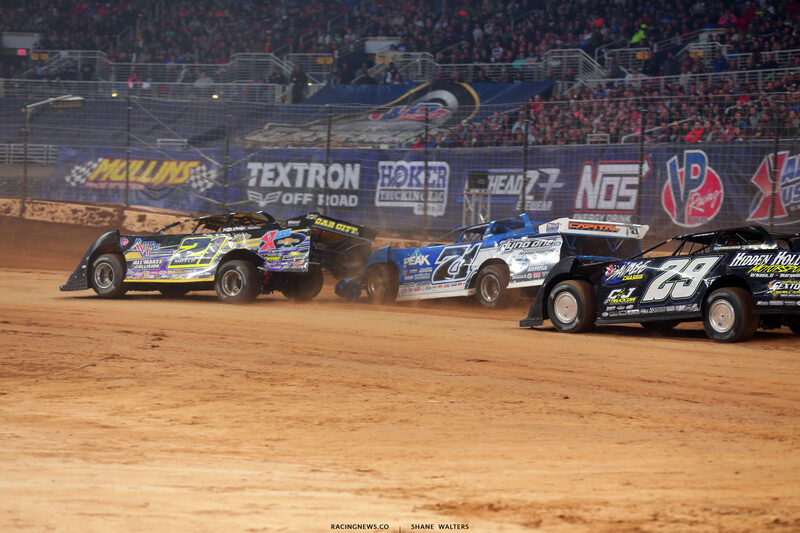 Pierce noses ahead off turn two. O’Neal fights back to his inside. Pierce leads lap one. Lap 2, several cars stack up in turn three. Herzog and NcCreadie pick up some damage. Moyer Jr comes to a stop. Green, Pierce leads. Lap 3, McCreadie jumps the cushion and tags the outside wall. He comes to a stop with more damage for the #39. Green, Pierce leads by two car lengths into turn one. 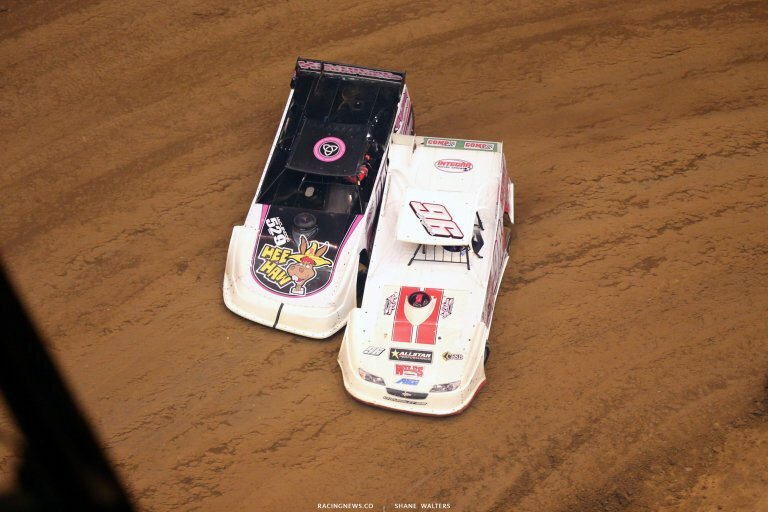 O’Neal and Moyer run side by side for 2nd. O’Neal holds the position. Lap 10, Zobrist tags the wall and comes to a stop in turn one. The caution is out. 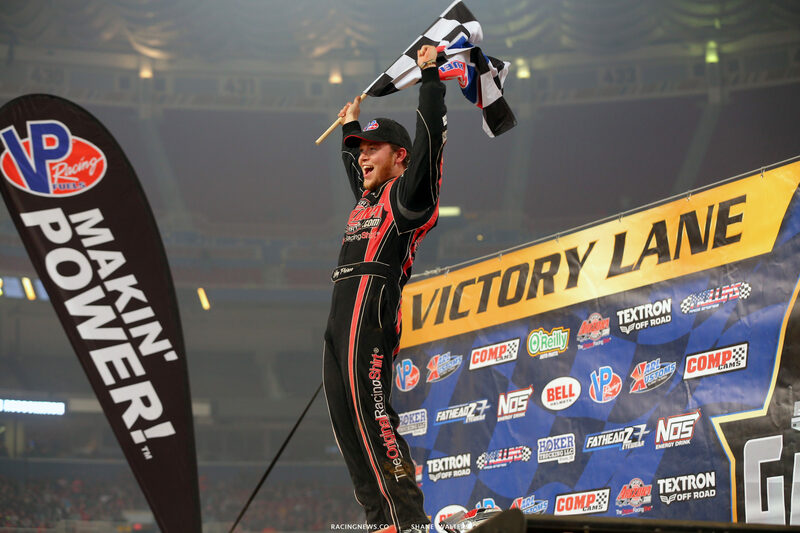 Green, Davenport has found speed on the cushion. He’s coming to the front in a hurry. Sheppard and Babb both run the same lane. Lap 13, English and Sheppard both have a flat tire. The caution is back out. Green, Pierce leads. Moyer takes over 2nd. Davenport, Herzog and Unzicker have tangled in turn three. Herzog was looking inside of Davenport. They ran out of room. Green, Pierce leads. Davenport pulls to the infield. 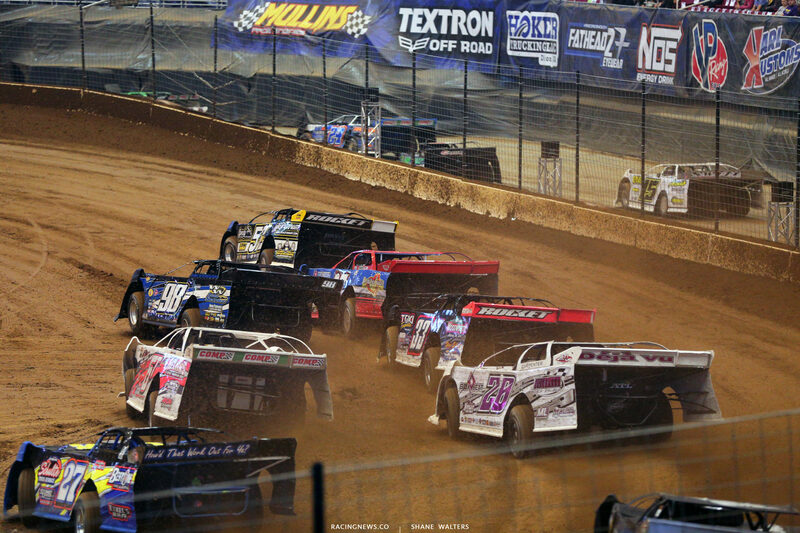 Bloomquist is around in turn one. Heavy nose damage for the #0. The caution is out. 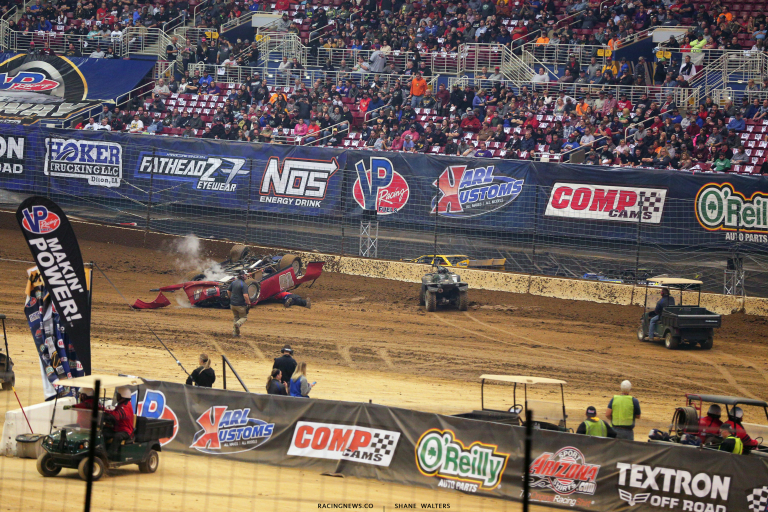 Green, O’Neal gets loose on the cushion off turn two. The #71 jumps sideways and he loses forward momentum. Moyer drives by on the bottom nearly a few others. Lap 23, Joey Coulter is around in turn one. The caution is out. Babb has lost his rear spoiler. Green, there’s a huge bump in turn one. Everyone rolls through it. Pierce continues to lead. Moyer is 2nd and Welshan is 3rd. Gardner is around, caution. Green, several cars stuck up behind Babb as he struggles to get going. A lap later, Babb has fallen to last. He pulls off the track. Bloomquist exits as well. Gardner is stopped, caution. Green, Pierce leads. He’s driving away from the field. Bobby Pierce wins the third addition of the Gateway Dirt Nationals! 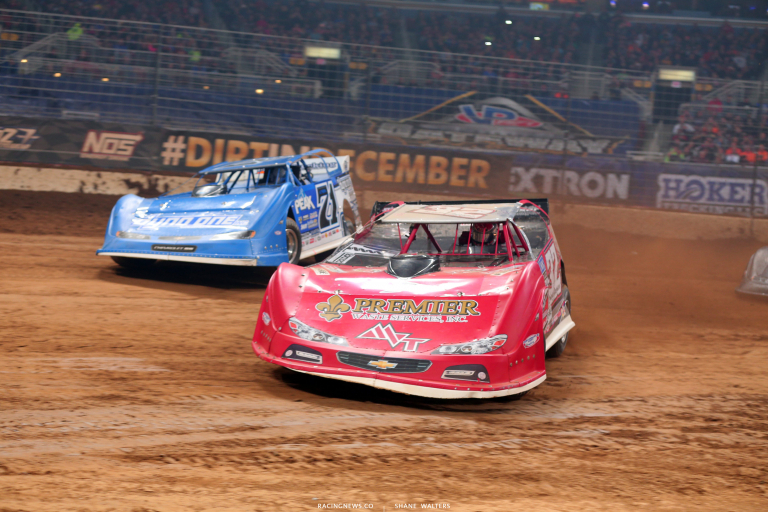 View full Gateway Dirt Nationals race results from all three classes below.